I served my ensalada xec for a salad-themed Food Bloggers LA meetup once, and it was a big hit. I love this recipe because it keeps crunchy in the refrigerator for a few days in the event that you have leftovers. I find this dish keeps best when refrigerated in a covered glass bowl. Some recipes for ensalada xec call for ground cayenne pepper, which is perfectly fine, but I prefer to use fresh chile. Habanero is frequently used in the regional cuisine in the Yucatan, so I used it in this recipe. If your tastebuds can’t handle the heat from a habanero pepper, you can substitute a finely chopped serrano chile or just use a dried chile powder of your choice. You could also use Tajín (the popular Mexican chile, lime and salt seasoning) sprinkled on top if you don’t want to use fresh chiles; if you use Tajín, remember to leave the salt out of the recipe. Peel and slice the jicama into small sticks. Put in a bowl or tupperware and squeeze the juice of one lime over the jicama, cover and refrigerate. Next, peel and section the oranges, mandarins and grapefruit and place in a large bowl. (To section citrus, slice one end off and then use a sharp paring knife to remove the peel completely. Make sure there is no white pith left behind.) After you section the citrus, you'll be left with the middle and a little bit of flesh. 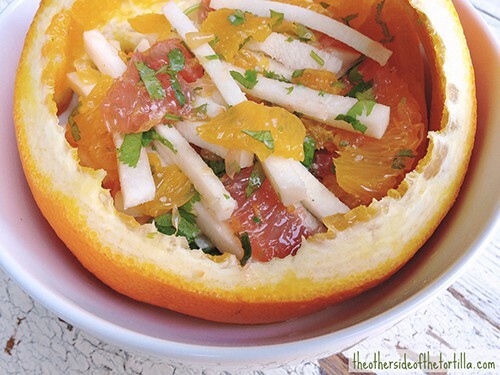 Squeeze the remaining juice out of each, into the bowl with the sectioned oranges, mandarins and grapefruit. Finely chop the habanero chile and 3-4 tablespoons of fresh cilantro and add to the bowl. Gently stir with a wooden spoon or spatula to mix. Now add the chilled jicama to the bowl, squeeze the juice of the other lime over the top and lightly toss the jicama and citrus together. Sprinkle the sea salt over the top. If not serving right away, you can chill in the refrigerator for up to three days. 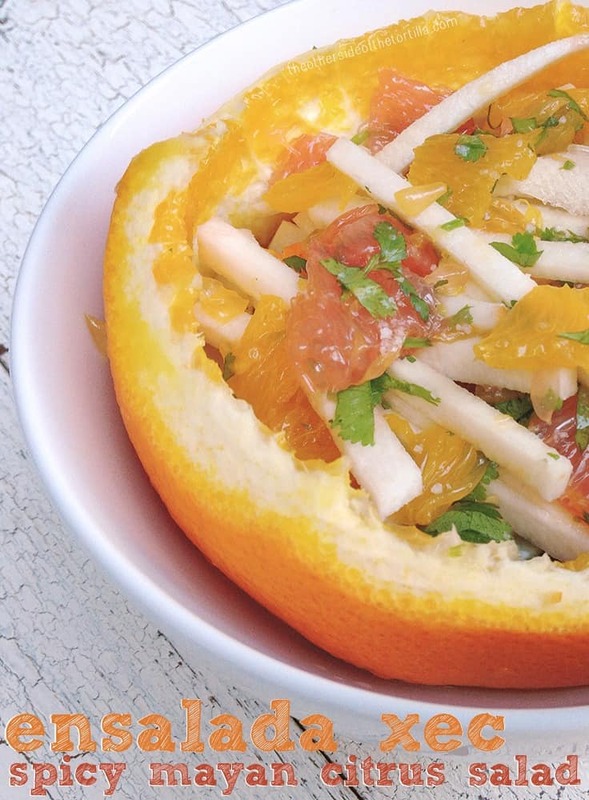 TIP: If you carefully remove the orange peels during sectioning so that they're one big spiral piece, you can use them as a decorative faux bowl to serve the salad (as pictured; you still need to put it inside a real bowl because of the citrus juice or it will leak). This was a fabulous salad. Greet meeting you at the FBLA meet up. This is beautiful and looks so fresh! I love the photo.